It's the 25th of the month, which means you know what is coming in two months time! Responses from the prize winners suggest that winning a competition was a first for some of them too! My other first this month was much messier than sewing, as my daughter-in-law and I treated ourselves to a cupcake decorating class a couple of weeks ago. Instead of dressmakers pins it was rolling pins that dominated our afternoon. We learned a number of different techniques and surprised ourselves at the standard of our finished cupcakes, not quite Great British Bake Off admittedly, but certainly much better than we had hoped for at the start of the day. Looks like a fun day cupcake decorating. Adding a neckline as specified in the Darling Daisy dress was totally new to me and with an outcome I was thrilled with, so I've added that project. Thanks for hosting! Congratulations on hosting a great competition. I look forward to it being a yearly event. Those cupcakes are gorgeous. I would have a hard time bringing myself to eat them. New to me this month is finally finishing a quilt, and finding a strange joy in adding a quilt label to a completed quilt. cake decorating skills are very good but remember the hips! stitching is so much easier on the figure! Oh those cupcakes looks so yummy! I was drooling over them when you first showed them on Instagram. You did a fantastic job! Those cakes look delicious, well done on acquiring another new skill. i have always wanted to take a cake decorating class but have yet to do it......someday. Looks like you had fun and you sure did have great results!! 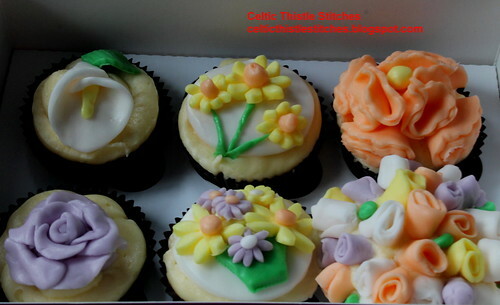 I am very impressed at your first attempt of decorating cupcakes, they look perfect and very yummy. My new-to-me was mastering the understanding of reading and using a new crochet stitch from a chart of unfamiliar to me crochet symbols. I am using the new stitch to design three styles of baby sweaters, the first of which I have linked here.